"You can't have enough basic little beads and the skills required for making them." OK, I lied....she was talking about little black dresses, but the sentiment is true! After mastering the basic form of this versatile little hollow bead, you'll be ready to create a whole jewelry wardrobe out of the variations. Let your imagination guide you! 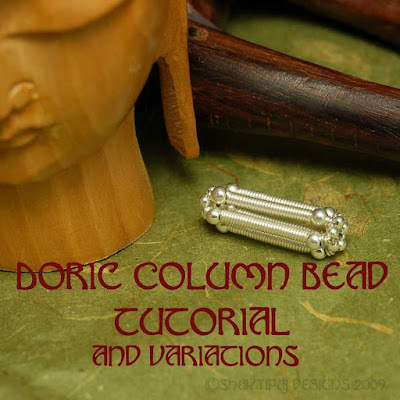 This tutorial contains wire handling how-tos, professional finishing tips, 65 photos, and 25pgs of detailed and comprehensive instructions for the basic bead AND THE VARIATIONS!!!!!! The PDF tutorial(1.6M) will be sent within 24 hours(usually MUCH sooner, but I sleep once in a while!) to the address listed in your paypal profile after receiving confirmation of your Paypal payment, so please be sure your profile is up to date. Further details can be found in my Etsy Profile.